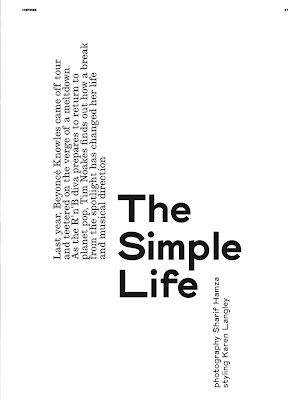 Simple Life? Anything but! Always "hot property," Beyonce appears on the covers of Essence, W magazine, Dazed and Confused and the upcoming issue of Vogue Italia...whew! This is my favorite shoot of those that I've seen...I love the "grittiness." The Simple Life - Beyoncé Knowles remains glamorous amidst a weathered setting lensed by photographer Sharif Hamza for the July issue of Dazed & Confused. The R&B diva discusses her break from music in the accompanying cover story and captivates in stylist Karen Langley’s retro glam looks, including pieces custom made for Dazed & Confused by Gareth Pugh, Haider Ackermann, Stefano Pilati for Yves saint Laurent, Tom Ford, Givenchy by Riccardo Tisci, and Marc Jacobs for Louis Vuitton.